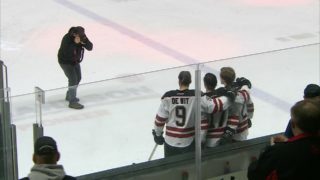 CALGARY — The Red Deer Rebels stirred the WHL Central Division standings with a 4-1 win over the Calgary Hitmen before 7,017 fans Sunday afternoon at the Scotiabank Saddledome. 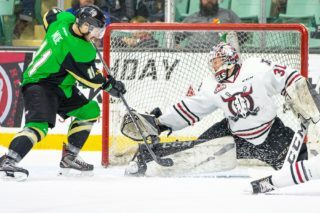 The Rebels jumped from fourth to second place in the division, one point clear of the Lethbridge Hurricanes and Medicine Hat Tigers and a single point back of the first-place Edmonton Oil Kings, who have played three more games than Red Deer. The Rebels opened a 2-0 lead after 20 minutes and never looked back. 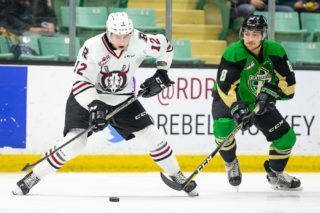 The Rebels were indeed playing their third game in three days and without the services of injured front-line players defenceman Alex Alexeyev and forward Jeff de Wit. Brandon Hagel, selected as the game’s first star, opened the scoring with a short-handed breakaway goal a mere 1:49 into the contest, and Alex Morozoff made it 2-0 when he a buried cross-crease feed from Brett Davis late in the frame. Arshdeep Bains went hard to the net and converted a feed from Hagel 1:40 into the second period, but Hunter Campbell jumped on a turnover at centre ice and notched a short-handed tally for the Hitmen just under nine minutes later. 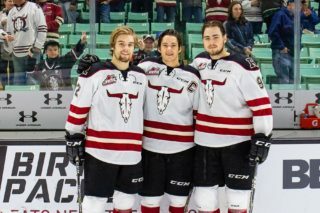 Red Deer defenceman Carson Sass rounded out the scoring with a power play marker at 14:41 of the middle stanza, his rising wrist shot from the point beating Hitmen netminder Jack McNaughton. McNaughton finished with 28 saves, while Byron Fancy turned aside 23 saves and was seldom tested, thanks in part to the fact the hosts were assessed 58 minutes in penalties compared to 22 for Red Deer. 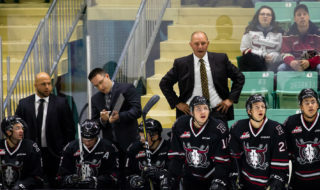 “It definitely was a funny game, he (Fancy) didn’t have a whole lot to do in the first period,” said Colville. The result left the Rebels with a 2-1 record in a torrid three-game weekend, with both wins coming on the road. The Rebels are idle until Friday when they host the Medicine Hat Tigers. The Prince George Cougars will visit the Centrium 24 hours later. The CHL/NHL Top Prospects game will be played Wednesday at the Centrium.